Cover pork chops with baking paper or cling film and use a rolling pin or saucepan to pound to an even 1.5cm thickness. For the pork marinade, whisk together the fish sauce, garlic, sugar, turmeric and pepper. Pour mixture over the pork and marinate for 10 minutes. 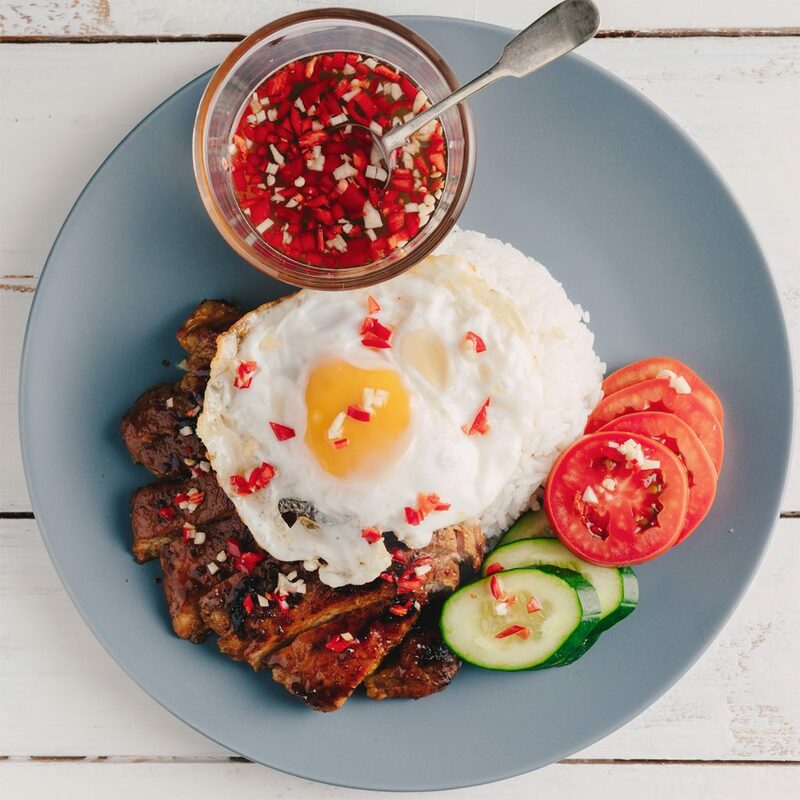 To make the nuoc cham dressing, combine the fish sauce, sugar, vinegar, lime juice and 1/4 cup of water in a jar and shake until the sugar dissolves. This can be stored in the fridge to use for up to 2 weeks. When ready to serve, pour out a small bowlful of the dressing and add the chilli and garlic. Heat 1 tablespoon oil in a large non-stick frying pan over high heat and cook pork for 3-4 minutes each side until just cooked through. Remove from heat to rest for 2 minutes. 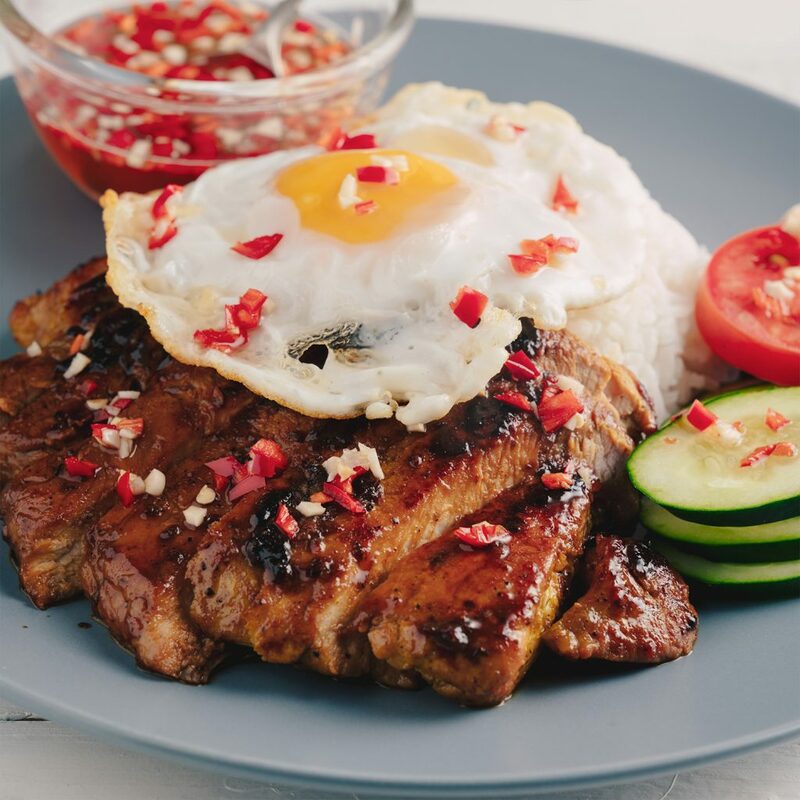 Serve pork with rice, egg, tomatoes and cucumber. Top the whole lot with generous spoonfuls of dressing. You can store your nuoc cham dressing in the fridge for up to 2 weeks.